MPs debate and vote on a series of amendments to Prime Minister Theresa May’s Brexit deal, with some focused on removing the threat of a ‘no-deal’ and others looking to remove the contentious Irish backstop. The UK is set to leave the EU on March 29. May tells MPs gathered in the House of Commons that they will get a further vote on her Brexit deal on February 14 if she fails to finalize an agreement with Brussels by that time. Pro-Remain Labour MP Peter Kyle tells the prime minister that if she votes for an amendment tabled by Tory Sir Graham Brady – which seeks to remove the backstop – then she will be voting against her own deal. She defends her intention to vote against her deal, insisting it demonstrates her willingness to listen to MPs. The PM later confirms her government’s intentions for reopening the Withdrawal Agreement with the EU, in a bid to make changes to the backstop she agreed with the bloc late last year. Labour MP Yvette Cooper’s amendment requires May to delay Brexit and extend Article 50 if she cannot secure a deal by February 26. May claims such a proposal would not rule out no-deal, just delay a decision on an agreement. Earlier John Bercow, the speaker, announced that he had accepted seven amendments to May's deal to be debated and voted on. Labour leader Jeremy Corbyn, who was rigorously shouted down by Tory MPs during his reply to the prime minister, revealed that his party will be backing Cooper’s amendment which would delay Brexit beyond the March 29 deadline. However, he says that any extension of Article 50 under the amendment should only be for three months. The Democratic Unionist Party (DUP) have indicated that they will be teaming up with the government and backing the Brady amendment. 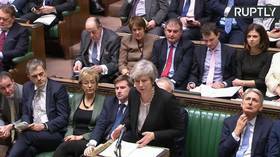 The decision to try to amend the legally-binding Withdrawal Agreement could ultimately prove futile for the prime minister. Various EU officials in recent days have either insisted they are not open to re-negotiation – full stop – or have demanded a workable alternative to the backstop. READ MORE: Brexit Plan B vote: Will MPs take control of UK’s EU divorce? The Guardian has reported that European Commission President Jean-Claude Juncker has told May that the price for looking again at the Irish backstop was to agree to a permanent customs union.